Haomei HZS series stationary concrete batching plant is a mandatory, efficient equipment, can produce plastic, dry hard concrete and other concrete, HZS series stationary concrete batching plant has high production efficiency, widely used in large and medium-sized building construction, road and bridge construction and production of concrete products in the prefabricated plant, it is the ideal equipment for the production of commercial concrete. Haomei HZS series stationary concrete batching plant include HZS25, 35, 50, 60, 75, 90, 120, 150, 180, 240 concrete batching plant, they are with different capacity which can meet the different demands of customers and projects. 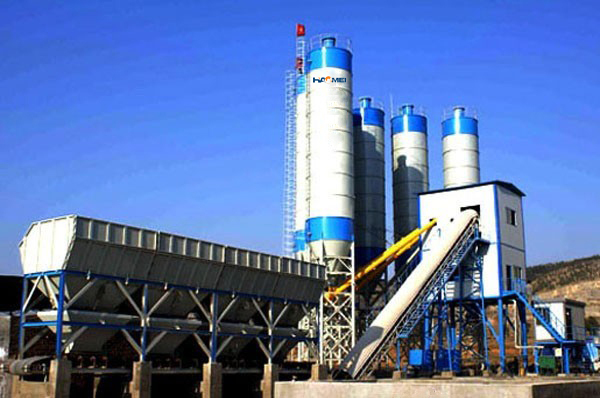 The same as other concrete batching plant, Haomei HZS series stationary concrete batching plant is composed by the ingredients machine, mixing host, screw conveyor, cement warehouse, weighing system, control system and other components. The mixing system host of HZS series concrete mixing plant adopts JS series double horizontal shaft forced mixer, with the homogeneous mixing concrete, short mixing time, wearing parts with long life, the operation and maintenance is convenient. HZS series stationary concrete batching plant adopts the latest designed electronic weighing, the computer control, digital display and other control technology, electronic weighing are equipped with a buffer device and automatic compensation function, it is with high precision measurement. Gravel feeding system using large-width cross belt feeding, with a pedestrian walkway, so the HZS series stationary concrete batching plant is the ideal equipment for majority of construction units to produce high-quality concrete. Haomei machinery always put the requirements of our clients to the first place, to solve all the problems in their business and project is our task. We believe that advanced technology, great production management and the best service will make Haomei machinery to get more clients and good reputation all over the world.